Singapore ranks among the most urbanised countries in the world. Presence of high rise buildings and developed infrastructure in the country are driving the demand for elevators and escalators. Although, Singapore is among mature markets for elevators and escalators, however, continuous expansion of private and public infrastructures, ageing population, and their need for convenient mobility buoyed the growth of elevators and escalators market in the country. Among different end user verticals, the commercial segment including corporate offices, malls, transport systems, hotels, hospitals, and others, contributed highest revenue share towards the overall Singapore Elevators and Escalators market share in the country. The segment is anticipated to continue its dominance during the forecast period as well owing to continuous installation of escalators across the commercial buildings. 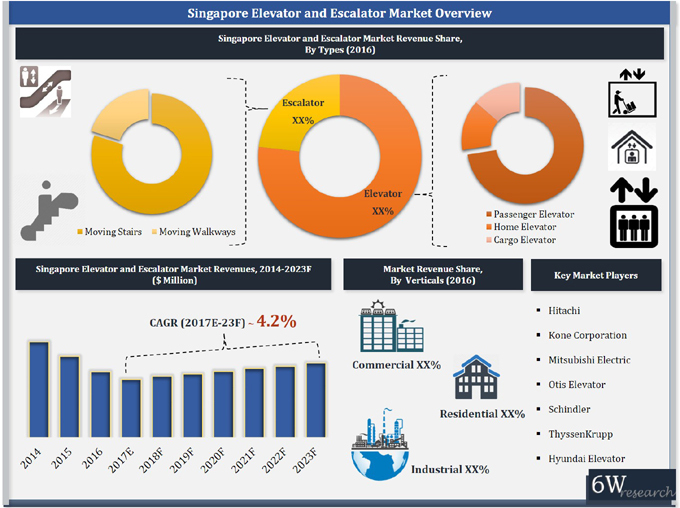 The Singapore Elevators and Escalators Market report thoroughly covers Singapore Elevators and Escalators market by types, services, and verticals. The Singapore Elevators and Escalators Market Outlook report provides an unbiased and detailed analysis of the Singapore Elevators and Escalators Market Trends, opportunities, high growth areas and market drivers which would help the stakeholders to decide and align their market strategies according to the current and future market dynamics.